The Mudbox team and I are super proud to announce the release of Mudbox® 2018.2 Update. This is an important and exciting release for us—plenty to talk about here—but before I begin, I suppose an introduction is in order. I’m a Principal Product Designer here at Autodesk, and I’ve spent the past several years focused on improving modeling, sculpting, and UV editing workflows in Maya. And last year, I was lucky enough to join the Mudbox team. First, a bit of a refresher on what we recently delivered with the Mudbox 2018.1 Update release, since it’s an important precursor to our 2018.2 Update story. After reviewing a backlog of defect reports and reconnecting with our beta community and subscribers, the team knew the first thing we had to do for Mudbox was to raise the quality bar and general stability of the product. Mudbox 2018.1 Update was basically a bug-fix release, focused exclusively on fixing defects, mostly those reported by you folks over the past few years. We delivered fixes to over 75 customer-reported defects with that release. But a lot of you asked a very crucial question soon after checking out that release: where are the new features?! The Mudbox 2018.2 Update release is our direct answer to that very question. For several years now, the number one request from Mudbox artists like yourselves was to add support for Dynamic Tessellation. With 80 votes on our Mudbox Ideas forum, loads of similar requests in our beta forums, and hey, even some nudges from our very own development team to finally complete this work for Mudbox (we’d had a prototype in the works for some time), I’m beyond excited to announce that we’ve finally delivered on this promise—you can now dynamically tessellate a mesh as you sculpt. For anyone who’s not already familiar with the concept, here’s a bit of a primer on what it is and the problem it sets out to solve, especially for concept artists. 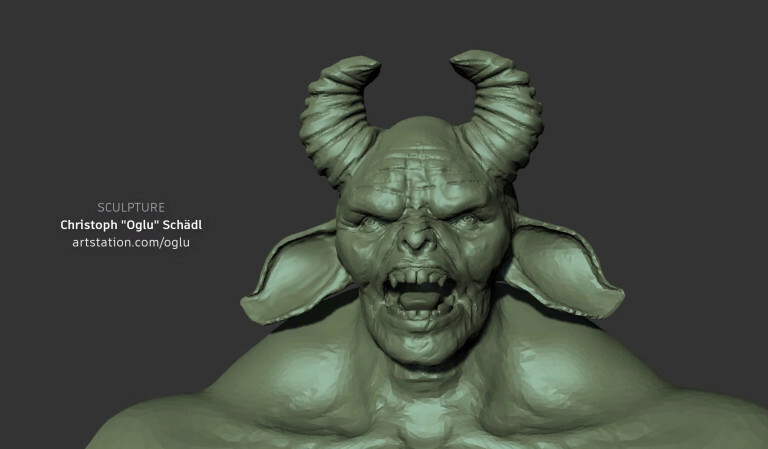 To sculpt in Mudbox, it used to be necessary to predict what form your model would need to take before you began adding detail to it. When you ran out of geometry to work with, you either needed to subdivide your model, thereby adding 4x the resolution with each added subdivision level, or create your base mesh with traditional modeling tools in a separate application like Maya or 3ds Max, taking valuable time away from the creative thought process and preventing you from just letting your ideas form as you sculpt. But what if your Mudbox sculpting tools could tessellate your mesh as you sculpt with them? And what if that tessellation is dynamic, automatically adding tessellation only where and when you need it? Well then, you’d have a solution that allows you to create extremely detailed models from scratch using a simple primitive mesh like a plane or sphere, all while staying in a single application: Mudbox! That’s Dynamic Tessellation in a polygonal nutshell. When we first introduced Dynamic Tessellation to our beta users, we were stoked. We knew they’d create some incredible artwork—that was a given, knowing that a large majority of our beta users are not only seasoned artists in their own right, but are also Mudbox veterans, having stuck around since the very beginning. We couldn’t have asked for a more passionate or engaged beta community—they’re as much a part of the story of this release as our own development team. We also recruited some new beta folks, after reading some of the feedback on our Area forums and seeing how passionate they were about Mudbox. And we’re very glad we did. So, let’s take a look at a couple of models created by two very different artists in our beta community using Dynamic Tessellation in Mudbox 2018.2 Update. You have a number of tessellation settings you can tweak, but for the majority of our users, you rarely if ever need to adjust the settings from their defaults. This is mostly because the thresholds which Mudbox determines whether to divide or collapse edges during tessellation are based in screen space—the closer you are to your mesh, the more tessellation you add to the surface while sculpting. Zoom in to add detail—simple as that. You focus on the concept—the shape and form of your model—while Mudbox takes care of the rest. Tessellation can also be used to selectively change the resolution of your mesh through three new brushes: Refine, Reduce, and Remesh. Use the Refine brush to add resolution to your mesh, and the Reduce brush to lower the resolution; in either case, you can set the target edge length. The Remesh brush lets you set both a minimum and a maximum edge length, so you can both refine and reduce a mesh at the same time, making small triangles larger and large ones smaller. It’s worth noting that the Academy® award-winning development team who brought Mudbox to life many years ago are the very same developers who brought this latest release and Dynamic Tessellation to life. They were as excited to work on this long-awaited feature as any of our beta users were to finally get their hands on it. So, thanks everyone…thanks for checking out this announcement, but more importantly, thanks for hanging in there with us over the last few years. It’s been a long time coming, but it’s finally here and we hope you’re as excited as we are and our beta users have been about it. Mudbox 2018.2 is available now to all subscribers. The trial, unfortunately, isn’t updated with the latest update release (it’s an accounting rules thing), however, Mudbox is still at its very affordable price of $10/month and of course you can cancel anytime if you’re not as happy as we are. While we look forward to what’s next for Mudbox, let us know what you think about this new feature set and how you’d like to see Mudbox evolve going forward on the Mudbox forum. And please do share your awesome creations in our Autodesk Gallery—the Mudbox team and I can’t wait to see what you folks do with this technology now that it’s out in the wild. Thanks for reading and … happy tessellating!